The Infinity Camera is a concept for a self generating art exhibition. It takes a rotating IP surveillance camera and surrounds it with screens of its own live footage. As the camera scans the room, it generates images that build upon themselves. A single pixel of light could exponentially grow into an infinite array of color. And due the nature of it being a public IP camera, anyone can check online to see what this little cam's up to. 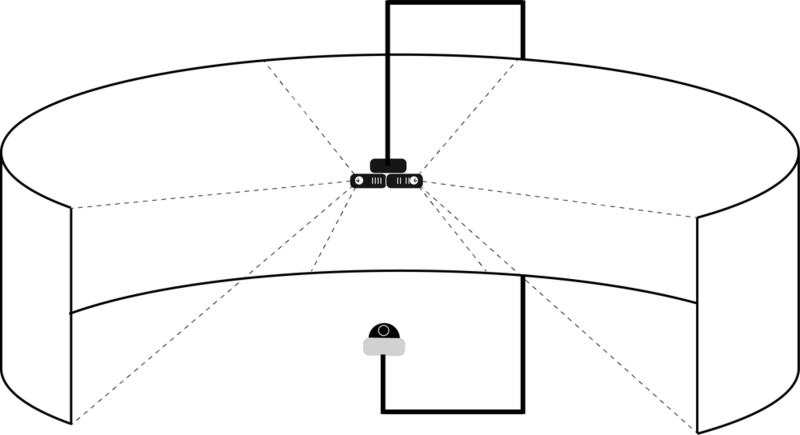 I imagine a large dimly lit spherical room with the walls being projected IP camera's feed by multiple projectors. As the IP camera revolves back and forth, it captures bits of light pixels. The imperfections of the camera's hue would create unexpected colors. Users may also walk around and create strange clones of themselves. Perhaps this is how a non-sentient being sees humans? For the prototype, I took three screens and displayed the IP camera's live feed on each one. The IP camera is controlled via a Python script. It's a simple script that controls the speed and duration of the camera's rotation left and right. Although the execution is fairly simple, I found the output to be quite magical. I began to imagine what it'd be like to be the camera. Seeing an infinity of my own sight.